Fall’s gentle rain and cooler temperatures make it the best time of year to clean your roof and home exterior. Ready your home for winter’s chill with a thorough fall roof cleaning using Wet & Forget Outdoor’s Hose End. 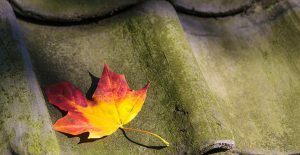 Why is fall the best time to clean my roof? 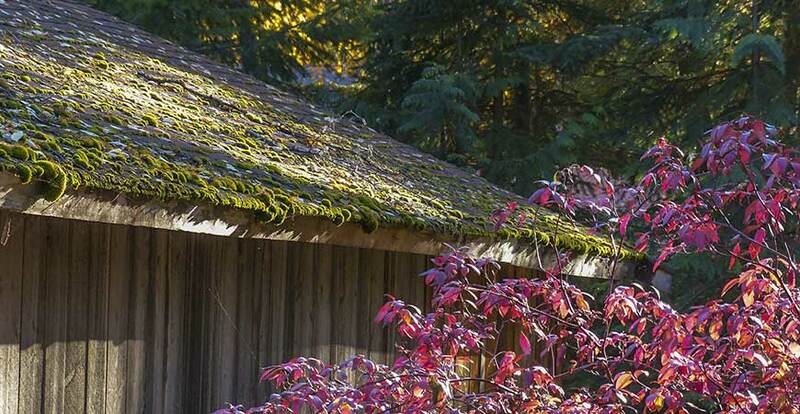 When leaves start to fall and land on your roof, they become wet from the rain, trapping in moisture. This also makes it easy for moss, lichen and other fungi to take hold and grow. If you notice a regular accumulation of leaves and twigs on your roof from an adjacent tree, a fall roof cleaning may be in order. Cool breezy conditions and gentle rains make autumn the ideal time to clean your roof and home exterior. I have ugly, black streaks running down my roof. What is it? Unsightly black streaks are caused by an alga named, “gloeocapsa magma”. This algae growth is usually seen on the northside of a roof, or in areas that are in constant shade. 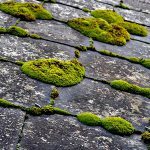 Algae that is not removed can eventually damage shingles, and in turn, shortens the life expectancy of your roof. 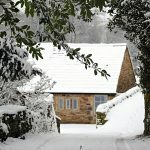 How will cleaning my roof help maintain it? 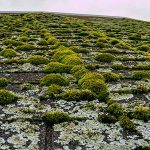 A roof that has moss, mildew, algae, or lichen runs the risk of growths attaching to the surface and actually growing into your shingles. Over time, these growths can break down roofing material which creates open, porous spaces for water to accumulate. This standing water eventually works its way inside your home to stain ceilings, mark walls, and encouraging mold and mildew indoors. Wet & Forget Outdoor Hose End allows you to apply Wet & Forget to your roof quicker and easier. The new, specially-designed nozzle easily attaches to your garden hose allowing you to clean hard-to-reach areas quicker and easier. The new Wet & Forget Outdoor Hose End product also treats large areas such as driveways and decks in minutes. Our new Wet & Forget Rapid Application Hose End allows you to apply Wet & Forget while standing on the ground. No more climbing ladders and walking on the roof! The hose end sprayer easily attaches to your garden hose. The spray reaches up to 30 feet – perfect for reaching high elevations. Each 48 oz. bottle of Wet & Forget Hose End covers up to 2,000 square feet. The comfortable side handle makes spraying easier. 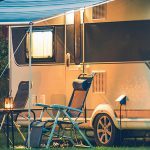 The product has an unlimited shelf life so you can easily store Wet & Forget Hose End – it will work just as well the next time your reach for it. Wet & Forget Outdoor is an easy-to-use outdoor cleaner – No rinsing, scrubbing or power washing is required. Just spray Wet & Forget Outdoor on your outdoor surfaces and then walk away. Spray it on, and you’re done! Wet & Forget Outdoor’s gentle yet effective formula works with the wind and rain to remove ugly moss, mold and mildew leaving the surface clean and growth-free for one year – or longer. Wet & Forget Outdoor is also non-acidic and contains no harmful bleach or phosphates. What do the settings on the hose end dial mean? WATER: The hose end will spray water, only. This is setting is useful for rinsing windows or landscape plants both before and after your apply the product to protect them from any potential overspray. Wet & Forget Hose End comes with two different hose end tips, the fan tip, and the jet-setting tip. These tips connect to the opposite end of the hose end sprayer. 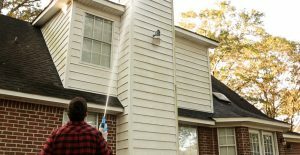 The Jet Setting shoots a stream of product up to 30 feet so you can spray up high elevations such as your roof and siding. The Flat Fan setting disperses the product in a wide, fan pattern – perfect for cleaning decks, driveways, patios, and other ground-level surfaces. Step 1 First, check the black dial on the hose end. Make sure the blue arrow is pointing to the OFF setting. Step 2 Attach the hose end tip most suitable for your application. Step 3 Connect the hose to the sprayer. Step 4 Turn on the water at the faucet. Step 5 Turn the dial to the WATER setting. Rinse down landscaping around the area you are applying to with water, to protect it from any potential overspray. Step 5 Turn the dial to the ON setting. This allows Wet & Forget Outdoor to mix with the water. Step 6 Saturate the surface fully with the Wet & Forget Hose End product. Then, turn the dial to the WATER setting and rinse surrounding plants and grass with water. When is the best time to apply Wet & Forget Outdoor Hose End? Apply Wet & Forget Outdoor when the outdoor temperature is above 55°F and below 80°F . It’s best to apply the product on a cloudy day, or on shaded surfaces, to limit product evaporation. Do not apply Wet & Forget Outdoor on a windy day. Some of the product may drift away, making cleaning less effective and have product go to waste. If I run out of product, can I refill the container with the Wet & Forget Outdoor Concentrate? The container is non-refillable. Wet & Forget Outdoor Hose End is available at Lowe’s, Menards, Ace Hardware and select hardware and home centers. Visit our Store Finder to find Wet & Forget Outdoor Hose End at a store near you. Or, click here to order Wet & Forget Outdoor Hose End through our secure website. Did you know? Cleaning your roof can extend its life for up to 20 years, or longer. Make fall roof cleaning quick and easy with Wet & Forget Outdoor Hose End.